Omar Khadr, Child Soldier: “Fact” or “Notion”? While he was detained, the Canadian mainstream media reporting about Omar Khadr was inaccurate and filled with misinformation. It seems like this tendency is not going to end with Khadr’s release. Although Canadian (English) mainstream media reports admit Khadr pleaded guilty for war crimes before a “widely discredited military commission”, most failed to recognize the fact that Khadr was a child soldier and was tortured while in detention in Bagram and Guantanamo. Yet, international law is unequivocal: if you are under 18 and used in an armed conflict, you are, by definition, a child soldier. A lot of reporters and columnists say Khadr was “considered by his supporters to be a child soldier”. This is not, however, a matter of consideration, but a matter of fact: 15, in an armed conflict = child soldier. Why are reporters shying away from this particular fact? Earlier in the day, the 28-year-old convicted war criminal was granted bail in an Edmonton court while he appeals his convictions in the United States…. He was captured in Afghanistan when he was 15 years old after a firefight with U.S. soldiers. He was accused of throwing a grenade that killed an American soldier. Mr Lukiwski’s whole statement is absurd: he rejects the “notion” that Khadr was a child soldier and says that it was “ a very deliberate, premeditated act, and he should pay the price.” First Khadr being a child soldier is a FACT, not a “notion”. Nobody can refute the fact that a 15 year old boy in an armed conflict is a child soldier and being 15 is far from being “a very deliberate, premeditated act”. Of course, Lukiwski was referring to the killing (alleged) of an American solider, being a deliberate act, but that is totally irrelevant to the fact that Khadr was 15 years old and a child soldier. Whether he killed or not, whether it was deliberate or not does not change the fact that Khadr was 15, thus a child soldier. 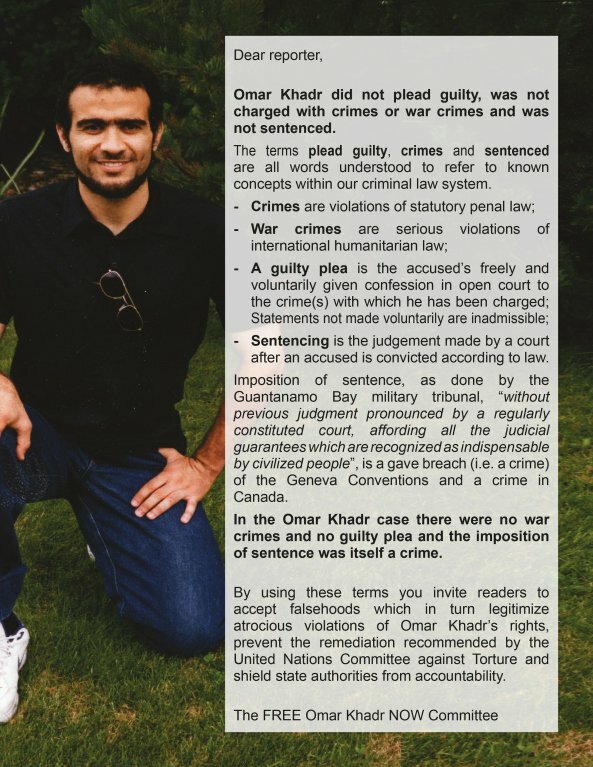 The International Law is unequivocal and applies to Khadr’s case: the “recruitment or use in hostilities of under-18s by non-state armed groups” is prohibited. Yet again, Khadr is only “considered by human rights groups” to have been a child soldier. Why so much disdain for legal standards? Were reporters told not to present Khadr as a child soldier? 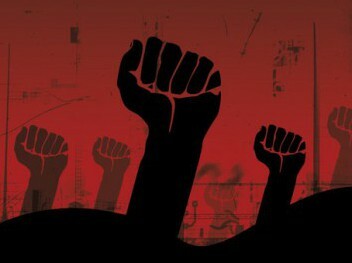 This entry was posted in Canada and tagged Child Soldiers, corporate media, Government Corruption, Guantanamo, human rights, Islamophobia, Law & Justice, Media Disinformation, Omar Khadr, social justice on May 11, 2015 by newsfortherevolution.